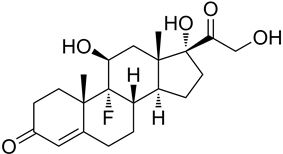 Fludrocortisone (also called 9α-fluorocortisol or 9α-fluorohydrocortisone) is a synthetic health system. Fludrocortisone has been used in the treatment of cerebral salt wasting syndrome. It is used primarily to replace the missing hormone aldosterone in various forms of adrenal insufficiency such as Addison's disease and the classic salt wasting (21-hydroxylase deficiency) form of congenital adrenal hyperplasia. Due to its effects on increasing Na+ levels, and therefore blood volume, fludrocortisone is the first line of treatment for orthostatic intolerance and Postural Orthostatic Tachycardia Syndrome (POTS). It can be used to treat low blood pressure. Fludrocortisone is also a confirmation test for diagnosing Conn's syndrome (aldosterone producing-adrenal adenoma), the fludrocortisone suppression test. Loading the patient with fludrocortisone would suppress serum aldosterone level in a normal patient, whereas the level will not be altered in a Conns patient. Renin plasma, sodium, and potassium is checked through blood tests in order to verify that the correct dosage is reached. Chemically, fludrocortisone is identical to cortisol except for the substitution of fluorine in place of one hydrogen. Fluorine is a good bioisostere for hydrogen because it is similar in size. The major difference is in its electronegativity. ^ Taplin CE, Cowell CT, Silink M, Ambler GR (December 2006). "Fludrocortisone therapy in cerebral salt wasting". Pediatrics 118 (6): e1904–8. ^ Freitas J, Santos R, Azevedo E, Costa O, Carvalho M and Falcão de Freitas A (2000). "Clinical improvement in patients with orthostatic intolerance after treatment with bisoprolol and fludrocortisone". Clinical Autonomic Research 10 (5): 293–299.